Using a serger is not as easy as working your sewing machine, but it is a lot more efficient. If you're thinking of stepping up your sewing machine game, you may be interested in purchasing a serger. 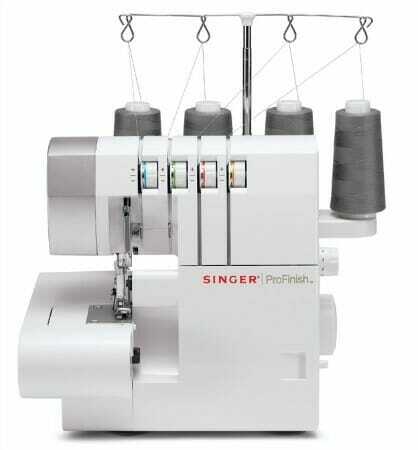 For a sewing enthusiast who is a first time serger, the SINGER ProFinish is made especially for you. If you're a beginner looking to invest in your first serger, then this affordable ProFinish is sufficient to support you through all the learning stages. Operating a serger for the first time can be intimidating. After all, these machines perform twice as fast as your standard sewing machine. No wonder most people are slightly scared of their serger the first time they use it! 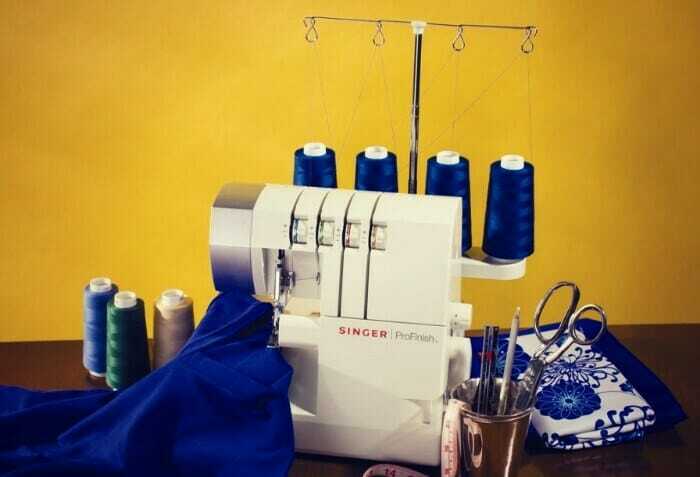 Luckily though, this SINGER serger is very easy to use. 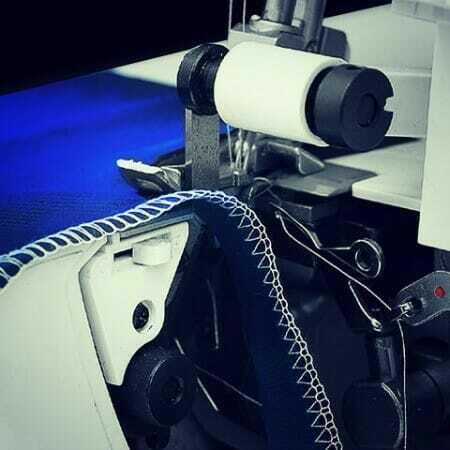 It contains all the basic features of a serger, such as differential feed and adjustable stitch length but changing these settings is quite intuitive. To further assist with the learning process, SINGER has included an instructional video for their ProFinish serger. There have many a multitude of positive reviews about this instructional video. The video is clear and easy to understand. It walks you through all the stages of setting up your serger. And we all know how frustrating it can be trying to loop all those threads into the right place without tangling them up. 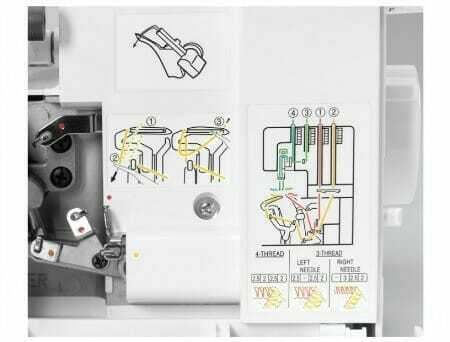 There’s even information about how to operate your serger. So, if you’re having trouble performing a particular stitch or for some reason your high quality threads keep breaking, check out the instructional video. At a price of around $300, you’re not going to be able to find a self-threading serger. That’s okay though because the SINGER ProFinish serger contains a color coded guide so that you can keep track of where each thread needs to go. And if that’s not enough, the SINGER serger comes pre-threaded. Reviewers are all excited over the pre-threaded serger since you can start serging the second you take your SINGER serger out of its packaging and plug it in. It cannot possibly get easier than that. Of course, the spool will eventually run out of thread or you may want to change the color you’re using someday. That doesn’t mean coming pre-threaded is a disadvantage. You now having a working model to demonstrate what a properly threaded serger should look like. The pre-threaded serger helps you to learn how a serger should be threaded, which will make it easier for you to rethread it in the future should you need to. The SINGER ProFinish serger comes with a free arm. To use this free arm, just remove the cloth plate. Having a free arm provides many advantages to when you’re sewing. It allows you to sew cylindrical things without trouble, such as cuffs, sleeves, collars and pant legs. The free arm also helps you to sew the little projects such as children’s clothing. A variety of accessories accompany the SINGER serger, including many different presser feet that can be substituted in. This allows for greater creativity and many different effects to be achieved for your sewing. Able to complete up to 1300 stitches per minute, many reviewers are impressed with the speed at which the serger can complete their projects. It’s fast enough to speed up the construction process but not too fast that it’s unmanageable. Furthermore, not everyone has space to leave their serger sitting around on their workbench. The carry handle to increase the portability of the SINGER serger has left many reviewers pleased with SINGER’s thoughtfulness. In our opinion there is only one thing to worry about this serger. According to a few reviews, extensive use of this serger can cause it to start smoking due to overheating. This involves running the serger way too fast or for an extended period of time. This “extended period of time” was found by a couple of reviews to be about 35 minutes of use. Which isn’t quite long if you’ve got a lot of work to complete by a deadline. The lesson to be learnt here is to work slowly. When working at a slower pace, the serger can last well over 35 minutes without overheating. Or, if you need to rush through your project, you may need to take some well-timed breaks to allow your serger to cool down before the machinery inside it gets fried. The inclusion of an instructional video and intuitive controls makes the SINGER ProFinish serger a great buy for first time users. 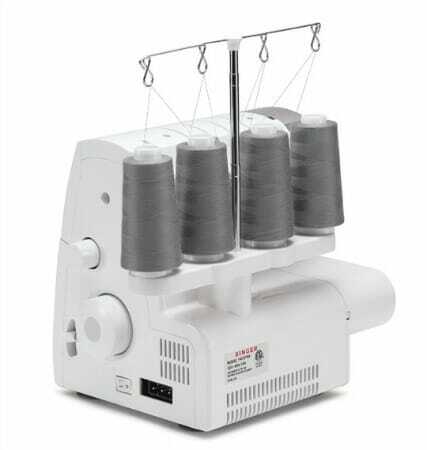 At a price of around $300, this is good value for a basic serger which contains all the necessary features. After all, as a beginner, you are probably not quite ready to invest in a high end serger just yet. If you’re someone who intends to be using this serger a lot and for at least an hour at a time, then perhaps it is not the right pick for you. You will be pushing the limits of this serger a lot, causing it to overheat frequently and potentially damage the motor. So, if you’re looking for a cheap serger for occasional use as a hobby rather than for work, then the SINGER ProFinish is the right pick for you. SINGER really cares about their customers and understand the difficulty of serging if it’s your first time. The creation of the ProFinish serger gives users confidence through the simple interface and the handy instructional video. The additional presser feet provided allows room for you to expand as you begin to gain confidence in serging. With the SINGER ProFinish and instructions in hand, all your sewing products will look like they’re made by a seasoned professional.